A close-up examination and exploration, How We Live Now challenges our old concepts of what it means to be a family and have a home, opening the door to the many diverse and thriving experiments of living in twenty-first century America. Across America and around the world, in cities and suburbs and small towns, people from all walks of life are redefining our "lifespaces"--the way we live and who we live with. The traditional nuclear family in their single-family home on a suburban lot has lost its place of prominence in contemporary life. Today, Americans have more choices than ever before in creating new ways to live and meet their personal needs and desires. Social scientist, researcher, and writer Bella DePaulo has traveled across America to interview people experimenting with the paradigm of how we live. 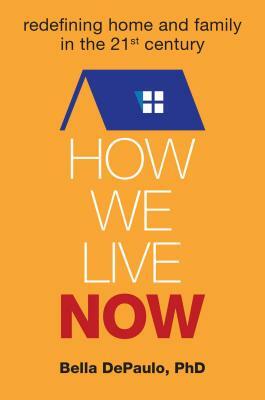 In How We Live Now, she explores everything from multi-generational homes to cohousing communities where one's "family" is made up of friends and neighbors to couples "living apart together" to single-living, and ultimately uncovers a pioneering landscape for living that throws the old blueprint out the window. Through personal interviews and stories, media accounts, and in-depth research, How We Live Now explores thriving lifespaces, and offers the reader choices that are freer, more diverse, and more attuned to our modern needs for the twenty-first century and beyond.